IHTN PODCAST -- in which co-hosts AYZ WARAICH (filmmaker/musician) + SARAH ROSANGELA (poet/essayist) shoot the breeze about movies, music, poetry, and all things creative -- anything but the news really. in which Sarah accuses Ayz of not taking the podcast seriously, and we discuss fighting the demand for constant content, NEIL BLOMKAMP's Oats Studios, 2 Days in the Valley, 90s TARANTINO, and a Mexican Robin Hood named JOAQUIN MURIETA. ___ AYZ: thewildmachine.com ayzwaraich.com twitter.com/ayz SARAH: sarahrosangela.com instagram.com/sarahrosangela I HATE THE NEWS: anchor.fm/ayz **if you dig the show, please consider leaving us a rating and review on iTunes Podcasts. It's what helps our little show grow across the globe. Cheers friend! in which ayz and sarah experience technical drama, have their first fight, and discuss about GHOST IN THE SHELL, WONDER WOMAN, FERGIE, an opera house in the middle of the brazilian jungle, WERNER HERZOG — plus we recommend RICH BRIAN, and a pretty surreal vacation spot in canada. IHTN 106 - WHERE HAVE WE BEEEN? 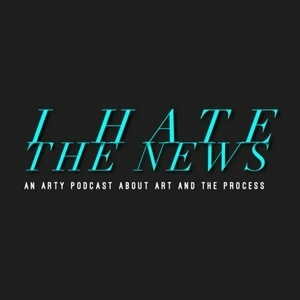 EP 101 - "I HATE THE NEWS" • EP 101 - "I HATE THE NEWS" • EP 101 - "I HATE THE NEWS" • EP 101 - "I HATE THE NEWS" • EP 101 - "I HATE THE NEWS" • EP 101 - "I HATE THE NEWS" • EP 101 - "I HATE THE NEWS" • EP 101 - "I HATE THE NEWS" • EP 101 - "I HATE THE NEWS" • EP 101 - "I HATE THE NEWS" • EP 101 - "I HATE THE NEWS" • EP 101 - "I HATE THE NEWS" • EP 101 - "I HATE THE NEWS"